Starting a new series today on the blog called Tasty Tuesdays! 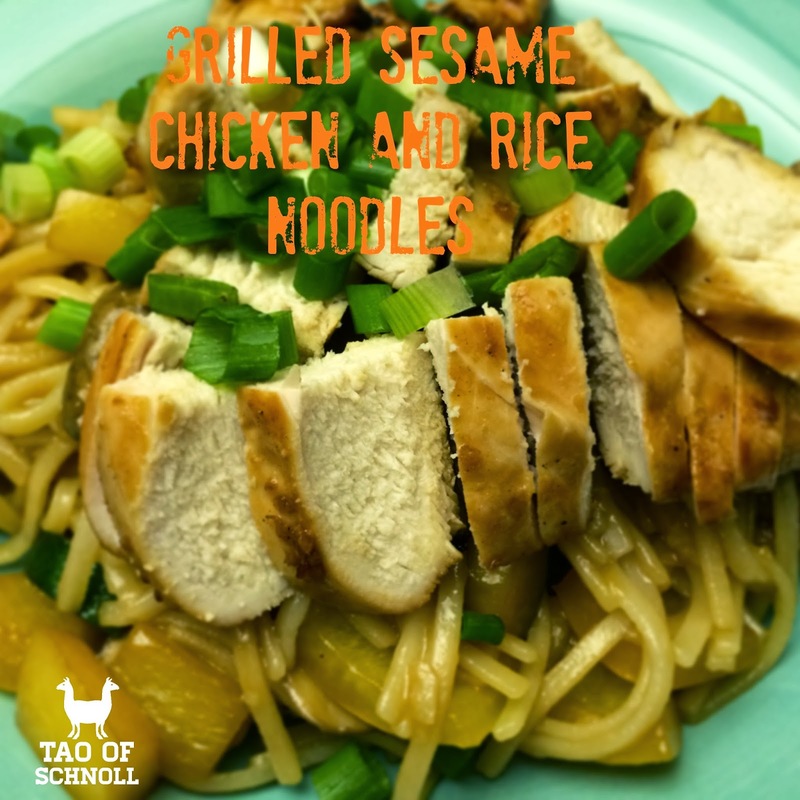 For this first one, it's all about Grilled Sesame Chicken and Rice Noodles. And best of all, it was easy to make it gluten free! I adapted the recipe from a very popular pin on Pinterest right now from The Pioneer Woman. I also had all of the ingredients (minus the fresh veggies) on hand which made it even easier! Hello $1.37 grocery bill! I made two separate bowls worth of the sesame marinade -- one for the chicken, and a fresh one to add at the very end to the noodles. I marinated the chicken for about 90mins in the fridge. I flipped and re-basted them about halfway through. This was my first time cooking rice noodles. I LOVE noodles so it's been tough trying this whole gluten free thing, so I was excited to finally have noodles again that I could eat. For the veggies, we chopped up zucchini, mushrooms, and yellow bell pepper and added them to a large sauté pan. I then drizzled a bit of sesame oil, gluten free soy sauce, and olive oil on top to help compliment the flavors of the marinade/dressing. Fresh green onions always add a bright flavor to the finished dish! To cook rice noodles, you bring a pot of water to a boil, then remove it from heat and add the noodles to soak. It was definitely a bit different for cooking and took a bit longer than it said on the box, but they eventually turned out great. Dave grilled the chicken and basted them while they were cooking. They turned out amazing! They almost had a sticky sweet flavor from the soy sauce and sugar in the marinade. I could not stop nibbling while waiting for the rest of the meal to come together! Once the noodles and veggies were cooked, I added them all to the same pan. I then poured the fresh marinade/dressing to the pan and tossed everything to combine. We then plated it with the sliced grilled chicken on top and fresh green onions. Talk about YUM! Whisk together one batch of the marinade, including the 2 Tbs. olive oil, until the sugar is dissolved. Put chicken breasts in a dish or bowl, and pour marinade over them. Flip to completely coat and cover the dish with saran rap. Marinate in the fridge for a minimum of 2 hours, turning half way. Once marinaded, grill the chicken. Baste with the marinade while cooking for extra flavor. Should take about 15-20mins depending on the thickness of your chicken. While the chicken is cooking, start cooking the veggies. Add all of the chopped veggies to a large sauté pan. Drizzle with 1 tsp. toasted sesame oil, 1 tsp. soy sauce, and 1 Tbs. olive oil. Cook over medium high heat until done. Once the pot of water is boiling, remove from heat and add the package of rice noodles. Soak in the hot water until soft, about 10 mins. Use a fork to help separate the noodles. When the noodles are done, drain well and mix with the veggies. Pour the 2nd batch of fresh dressing over the noodles and veggies, and mix to combine. Slice the grilled chicken on a cutting board. Serve the noodles and veggies in a deep dish and place the sliced chicken on top. Sprinkle with sliced green onions.